The landscaping anchors the house to the property. “We wanted it to feel like it has been here for a hundred years or more, settled down into the land, with gracious plantings that are part of the homestead rather than being formally ornamental,” says Tim. The Renyis’ friend Dave Stackhouse of Stackhouse Landscaping salvaged stones from an old stone wall on the property and built a new wall that separates the lawn from the meadows beyond. “It looks like it’s been here for several generations,” says Hannah. The house was sited so that it would feel anchored to the land, and trees were cleared for a lawn that transitions to a meadow and then to the woods. This not only provides a visual transition common to farmsteads but also allows for maximum solar gain while renaturalizing the cleared area. 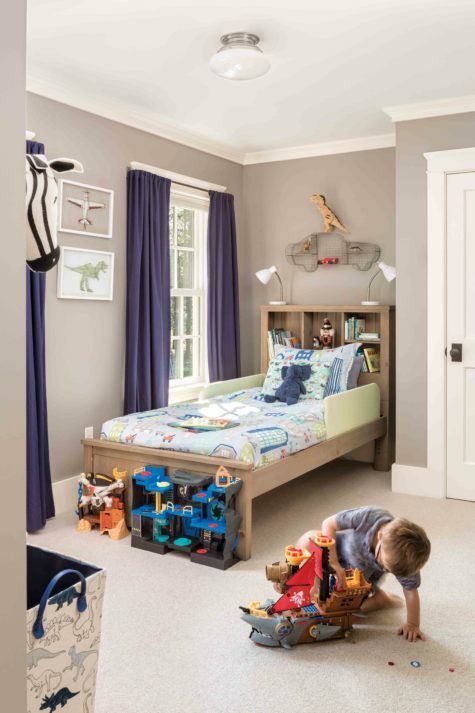 At their previous home, Tim and Hannah Renyi worked with Jared Prentiss, Knickerbocker’s site superintendent, who was a cabinetmaker in his former life. “Because the Renyis thoroughly enjoyed working with Jared and other crews, subs, and vendors on their earlier projects, we worked hard to keep the same team in place for Chestnut Way,” says construction manager Steve Berger. The farmhouse’s custom millwork elements include this wine storage under the stairs. Hannah found the reclaimed newel on the main staircase at Portland Architectural Salvage, and it’s an exact match to the one in their old house. The home features the functionality of a modern family home with the feel of an older house. Two leaded glass windows in the kitchen and foyer came from Portland Architectural Salvage and Old House Parts Company in Kennebunk. View of a bathroom with a clawfoot tub. The reclaimed antique pine beams in the great room were sourced from Down and Back Wood Salvage and came out of an antique barn in Friendship. They were hard to find, because they needed to be long enough to span the entire length of the room and required careful integration with the ceiling mouldings and the granite fireplace surround, which came from the foundations of Maine houses dating back to the early 1800s. 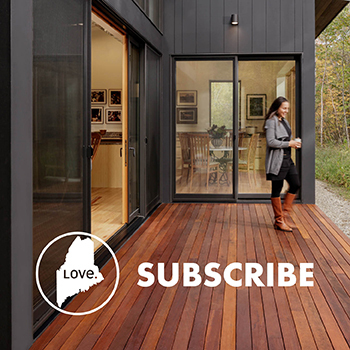 On weekend days, Tim and Hannah enjoy outdoor projects, so having livable outdoors spaces was high on their priority list. “The best days end with grilling on the screened porch and eating out on the patio or spending time by the pool, frequently having friends or family over for informal barbecues. 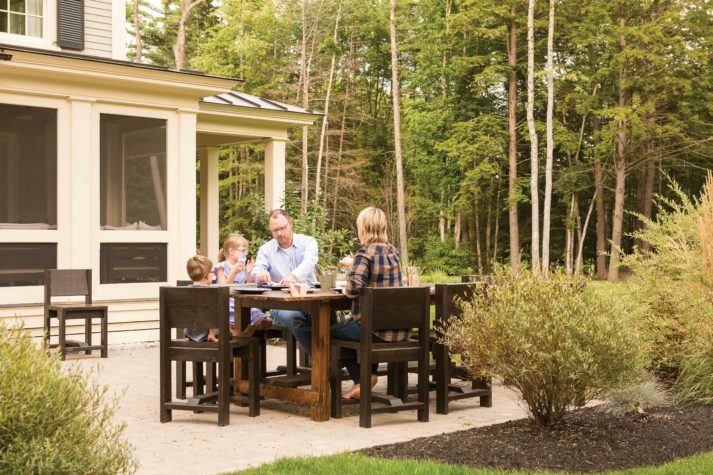 To be connected with the outdoors while still in a living space is ideal,” says Hannah. 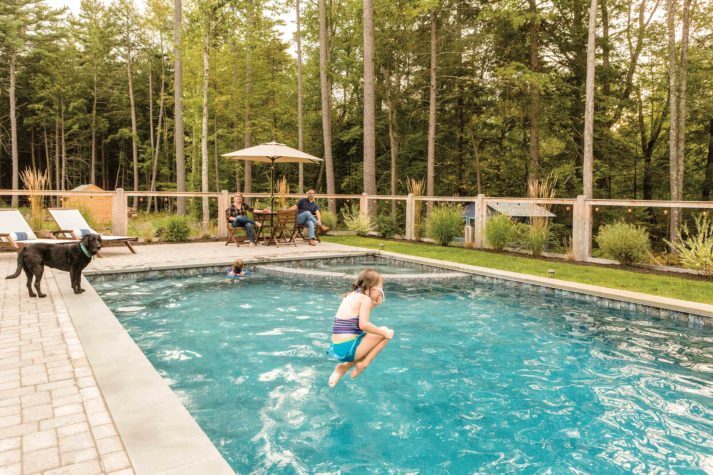 Aquatic Development by Tapley was responsible for the in-ground pool. 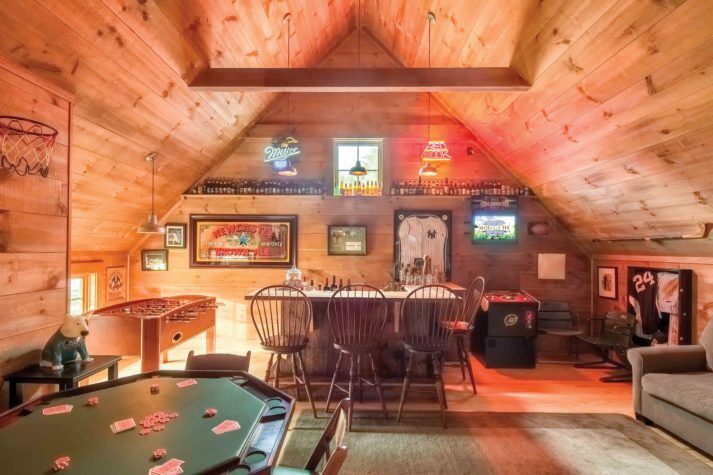 The barn space was designed to act as a social setting for the family and their friends, and the bar and rec room, aka the “sports cave,” allows Tim to display memorabilia from his time working in the sports industry for various teams and properties. Hannah went camping every summer at Hermit Island Campground in Phippsburg, and Tim and his family stayed all along the Maine coast before settling in New Harbor, where he spent most summers throughout high school and college. When the two met in Boston in 2002, it was through mutual friends from Maine. As they began dating, they spent many weekends at Tim’s family home in New Harbor. “We would always be driving home on 295 through Portland and say, ‘Wouldn’t it be great to live here?’” recalls Hannah. In 2008 they were newly married and living in southern California, but it didn’t really feel like home to them. When Hannah received a job opportunity at L.L.Bean, they decided it was time to make Maine their home. “We had found our happy spot,” she says. After living in an old farmhouse in the heart of Cumberland, the Renyis decided to build their next home. They had a general idea of where they wanted to live but had a hard time finding the right piece of land. One day they stumbled across an eightacre wooded parcel tucked back from Route 88 in Cumberland that had been on the market for a while. 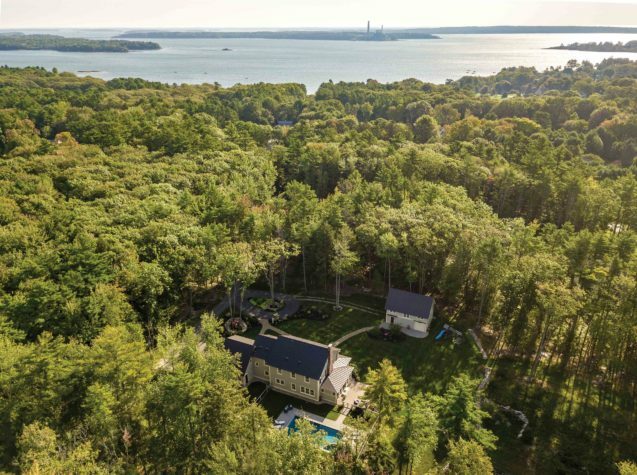 “We liked its private but central location, but we were intimidated at first by how densely wooded the land was,” says Hannah. Luckily, the Renyis knew just who to call to get a better sense of the property’s potential. 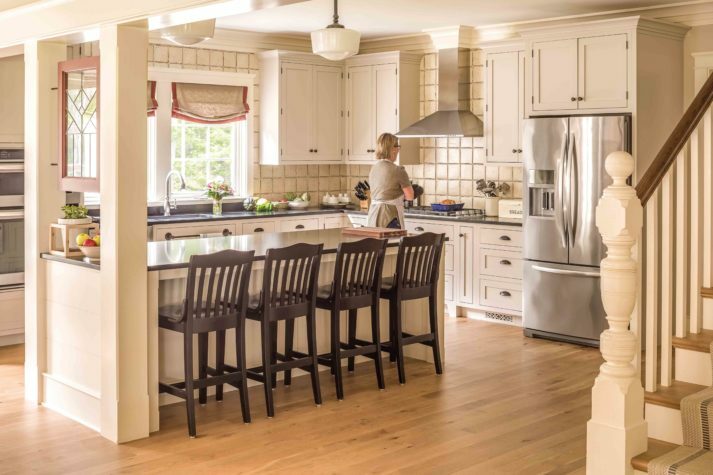 The couple had a longtime relationship with Knickerbocker Group, who had not only worked with them on extensive renovations to their previous home, but had also built Tim’s parents’ house. “After working with them on our first house, we felt like they were part of our family,” says Hannah. Trekking through the property’s underbrush in the snow one day, Knickerbocker president Steve Malcom started painting a picture for the Renyis of their future homestead. 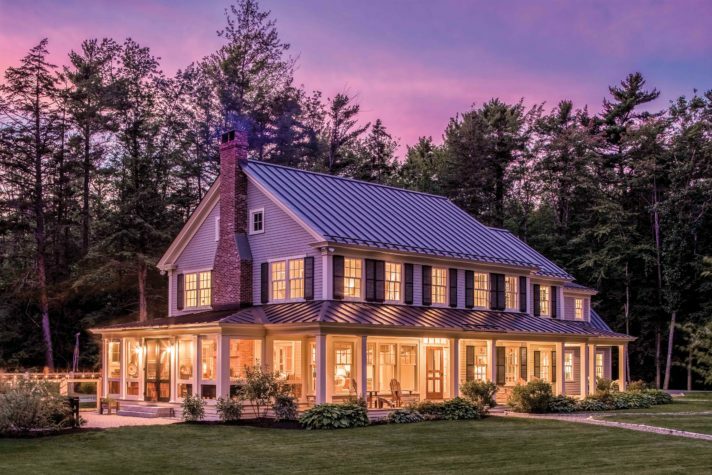 “We spent hours with Tim and Hannah crisscrossing the property, ultimately not only staking out the home, barn, and driveway but also a building envelope for a second lot that could be split off and sold to help recoup some of the acquisition costs,” says Malcom. The house was carefully sited so that it would feel anchored to the land, and trees were cleared for a lawn that would transition to a meadow and then to the woods. This not only would provide a visual transition common to farmsteads but also allow for maximum solar gain while renaturalizing the cleared area. Woodland buffers were planned between the two four-acre lots, and the barn was sited to create a focal point and another layer of privacy. The driving inspiration for the house was the family’s love of their previous house, an 1840s farmhouse in the heart of Cumberland. “Old farmhouses breathe a sense of history—they have character and a sense of solidity, having stood the test of time,” says Malcom. The Renyis admired this sense of history and shared an appreciation for the quality craftsmanship and beauty found in art and antiques. 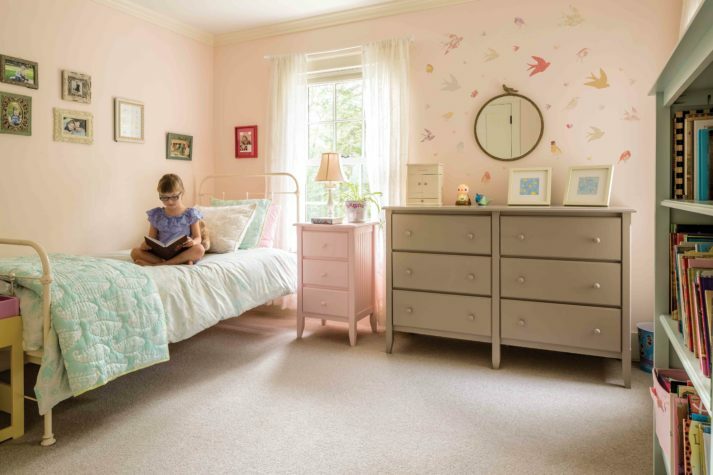 But, as they grew to a family of four, they realized that while the house had a lot of square footage, most of it was wasted because it was broken up into small rooms. “We love to entertain family and friends, and we could barely get more than four adults seated comfortably at a time in any one room,” says Hannah. As a result, the goal for Knickerbocker was to design a house that would have all the functionality of a modern family home but with the feel of an older house. The design included large, open gathering spaces with smaller, private rooms for activities known to be noisy or messy. The floor plan resembles that of an older, traditional home—a formal entry, sitting room, living room, dining room, den, and kitchen—but here, walls have been left out. Spaces are defined instead by reclaimed beams and columns that simultaneously create separate areas while allowing for interaction and improved circulation. In the central gathering space, a custom fireplace with hand-selected pieces of granite serves as the hub, and a large screened porch with French doors on each side both feels like an outdoor room and adds to the main living space during large family gatherings. “Outdoor space is really important to us,” says Tim, “so we knew we wanted a screened porch and an outdoor kitchen area that would be easily accessible from the main house.” The den is the one space on the first floor tucked away as a private refuge. The list of salvaged items found throughout the home is long; it’s a testament to the Renyis’ love of antiques and history and Knickerbocker’s skill at weaving old with new. Two leaded glass windows in the kitchen and foyer came from Portland Architectural Salvage and Old House Parts Company in Kennebunk. The reclaimed antique pine beams in the great room were sourced from Down and Back Wood Salvage and came out of an antique barn in Friendship. They were hard to find, because they needed to be long enough to span the entire length of the room, and they required careful integration with the ceiling mouldings and the granite fireplace surround. 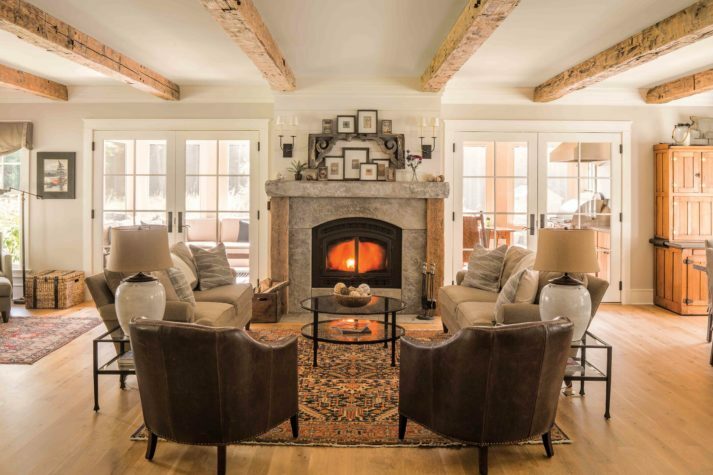 The brick on the porch fireplace was salvaged from a turn-of-the-century building in Portland, and the granite around the fireplace in the living room came from the foundations of Maine houses dating back to the early 1800s. The soapstone sink in the barn was a personal gift from project manager Steve Berger, who had salvaged it from a building in Boothbay he demolished years ago and held on to it for just the right project. The reclaimed newel on the main staircase that Hannah found at Portland Architectural Salvage is an exact match to the one in their old house. Even the barn is modeled after the barn of their old home, with its unique half-moon sliding-door design (They even chose the same paint colors for it.). The barn space was designed to act as a social setting for the family and their friends, and the bar and rec room allow Tim to display memorabilia from his time working in the sports industry for various teams and properties. The bar was constructed out of old barn boards found at their previous property to create the feel of an old watering hole. 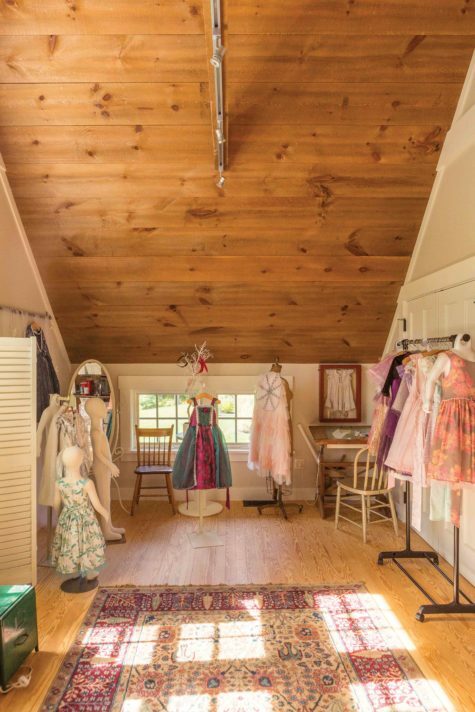 The barn also houses Hannah’s studio, where she designs and makes custom children’s clothing, fancy dresses, and costumes for her business, By Goldenstar. Not only was it important that the home itself feel older than it was, it was also paramount that the landscaping root the house on the property. “We wanted it to feel like it has been here for a hundred years or more, settled down into the land, with gracious plantings that are part of the homestead rather than being formally ornamental,” says Tim. The Renyis’ friend Dave Stackhouse of Stackhouse Landscaping salvaged stones from an old stone wall on the property and built a new wall that separates the lawn from the meadows beyond. “It looks like it’s been here for several generations,” says Hannah. Because Hannah and Tim were so involved in the design and building process, they got to know many of the craftspeople who worked on the house. Hannah was pregnant during design, and their second child, Daniel, was born in the middle of construction. Whenever Hannah would bring him to the site for meetings, he slept most peacefully when construction noise was at its loudest. “If it got quiet, he would wake up and cry, and the guys would all stomp around trying to get him back to sleep,” says Hannah. “Their personalities are a big part of the story of our home.” Their personalities, yes—and also their talent and craftsmanship, coupled with Hannah and Tim’s respect for the past with an eye toward the future. 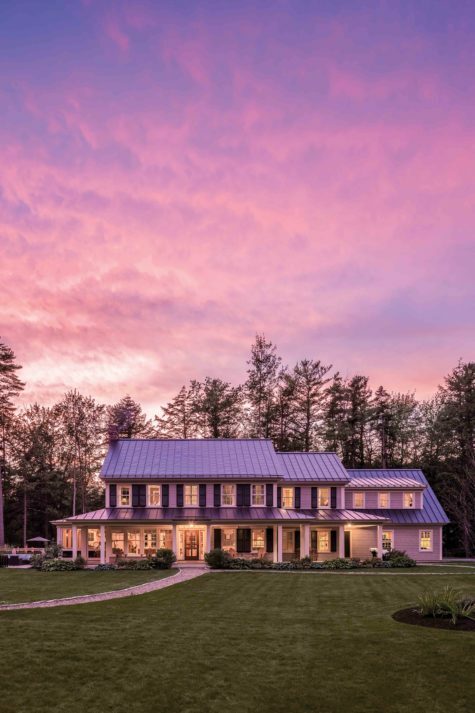 The driving inspiration for this house designed and built by Knickerbocker Group was the Renyi family’s love of their previous home, an 1840s farmhouse in the heart of Cumberland. “Old farmhouses breathe a sense of history—they have character and a sense of solidity, having stood the test of time,” says Knickerbocker president Steve Malcom. The design of the dining room centered around an antique Hoosier cabinet built by Hannah’s great-great-grandfather. 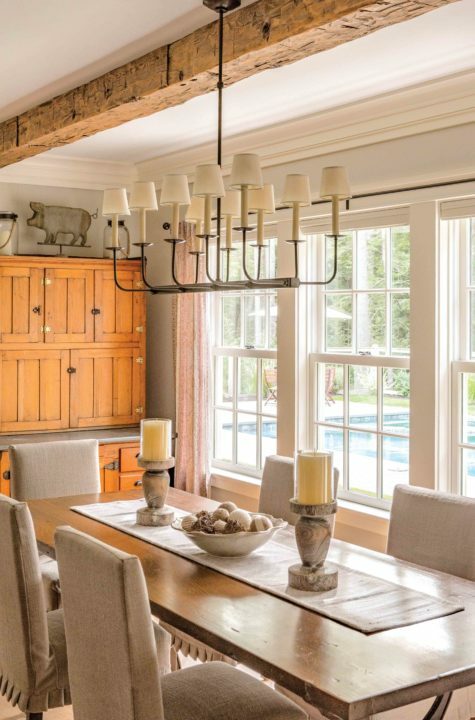 The dining table was custom built to accommodate large family gatherings and to blend seamlessly with the farmhouse aesthetic. 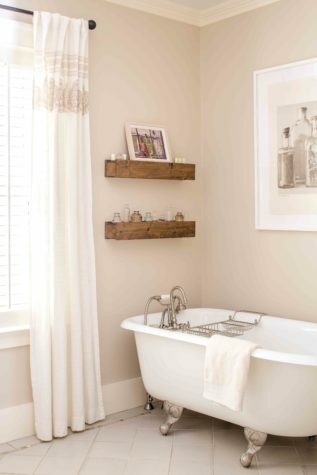 The top is made of reclaimed wood that has been sanded and finished, preserving the history of use though the years but creating a beautiful patina. The base of the table is constructed from antique machine legs salvaged from a factory in the Northeast. A large screened porch off the living area with an outdoor kitchen and fireplace feels like an outdoor room and adds to the main living space during large family gatherings. 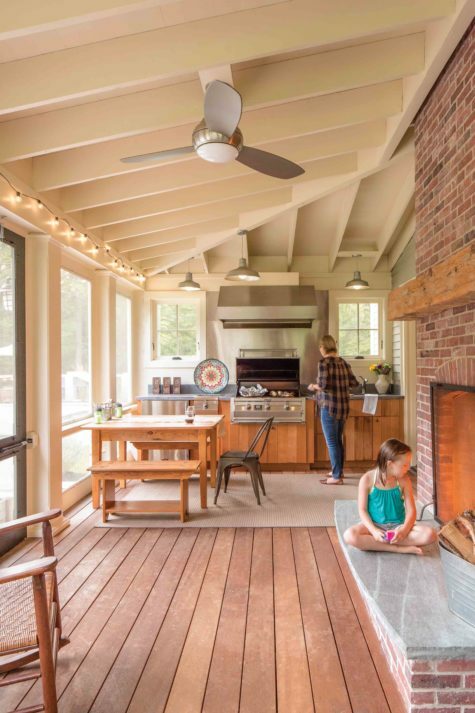 The brick on the fireplace was salvaged from a turn-of-the-century building in Portland. Glass panels can be installed on the porch during colder months so the space (and grill) can be used year-round. The barn houses Hannah’s studio, where she designs and makes custom children’s clothing, fancy dresses, and costumes for her business, By Goldenstar. 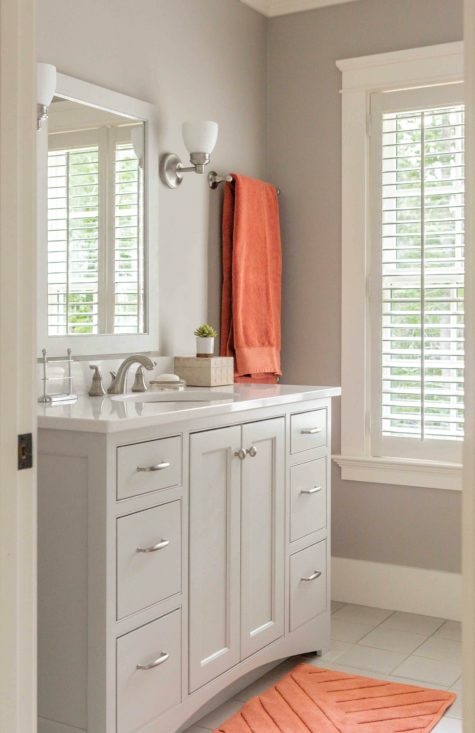 Many of the colors inside the home, like here in a bathroom, were drawn from a historic palette, unifying the spaces in the sense of an old farmhouse. “The selected tones have a softness about them, like the feeling of a diffused edge; you won’t see any colors in the home that are jarring or overwhelming in saturation,” says interior design manager Brady-Anne Cushing. Hannah and Tim’s son playing in his room. The Old House Parts Co.
Gagnon Heating & Air Conditioning Inc.